Today’s popular “Saturday Night Live” players could be tomorrow’s Fox sitcom stars. The youngest of the Big 4 networks currently has two “SNL” alums starring as leading men on its Top 2 live-action comedies, with Andy Samberg anchoring “Brooklyn Nine-Nine” (No. 2) and Will Forte playing the titular character on “The Last Man on Earth” (No. 1). Samberg’s talented showrunner, Mike Schur, also hails from Lorne Michaels‘ sketch comedy show, where he wrote for six seasons. So why are so many players and writers ending up at Fox Co-Chief Dana Walden and Gary Newman’s network, as opposed to NBC where “SNL” actually airs? One simple theory could be that NBC is shying away from primetime comedy, and Michael’s production company, Broadway Video, parks itself mainly in late-night. Or it’s even simpler as Samberg summed it up: “It’s as straightforward from my perspective as they wanted to make shows for us,” he told TheWrap. “I don’t put too much thought into where something is airing, as long as it’s something that I think is going to be good, but they were really accommodating and we all liked what they had to say, and it made a good fit,” he said. Also joining the two guys in “Fox’s SNL Alums Club” is Nasim Pedrad, who starred on last year’s one-and-done “Mulaney,” and now has moved over to this season’s freshman horror comedy “Scream Queens” from Ryan Murphy and Brad Falchuk. The man behind Pedrad’s first sitcom, John Mulaney, was “SNL Weekend Update” head writer and occasional on-air talent before hopping aboard the Fox comedy train. Fox-SNL connection even goes beyond the three present sitcom stars with depths of recurring actors who have made the move, including Jason Sudeikis as Forte’s “Last Man” brother, and Bill Hader guesting on “Brooklyn” as Samberg’s new captain this season. This reunited group of merry men — and at least one woman — prove that cliche adage, which reminds us that in Hollywood it isn’t always what you know, but who you know. And in a crazy comedy incubator like “SNL,” relationships run particularly deep. So these collaborations can be partially credited to old friends simply still wanting to play together. For his part, Samberg’s pal Forte wasn’t quite sure why the trend is happening, but he both still loves NBC and digs his new Fox camaraderie. “Certainly there is a part of it that’s just coincidence,” he added. Fox’s Executive Vice President of Comedy Development & Programming Suzanna Makkos doesn’t think it’s coincidence, though. 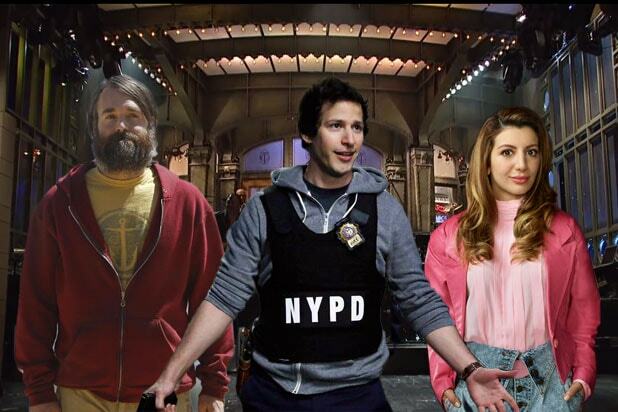 Both she and Samberg credit the aforementioned Schur for getting the “SNL”-to-Fox pipeline rolling. “Once we started to know those people and they started to know us and were hearing such great things from their friends about the working relationship that we have here, that really seemed to open the door for a lot of things,” Makkos told TheWrap. And the “SNL” fan is thrilled with how that’s worked out thus far. Makkos now has talent that’s been through intense comedy boot camp and is ready to roll. That affectionate feeling is mutual. One of the usual points of contention between comedic actors and networks is the dreaded notes situation, which at worst sees pencil pusher businessmen and women trying to tell comics what is funny and what isn’t. That’s not the case at Fox, the crossover stars say. With such glowing experiences and positive word-of-mouth, perhaps more of Forte and Samberg’s funny friends will defect from “Saturday Night Live” to Fox. When asked who currently on “SNL” Makkos would want as a Fox talent, Makkos didn’t even hesitate: the EVP would take young stand-up comedian Pete Davidson — who was actually discovered for “SNL” at a Fox comedy showcase — in a heartbeat. But don’t presume to see Pete making the switch after Season 41 of the Saturday night staple. Pedrad’s “Scream Queens” debuted on Tuesday, Samberg’s “Brooklyn” Season 3 and Forte’s “Last Man” Season 2 premiere on Sunday.